The South London Business Awards have been developed by Prospects Services (SLB), the aim is to recognise and celebrate the many dynamic and innovative businesses in South London. 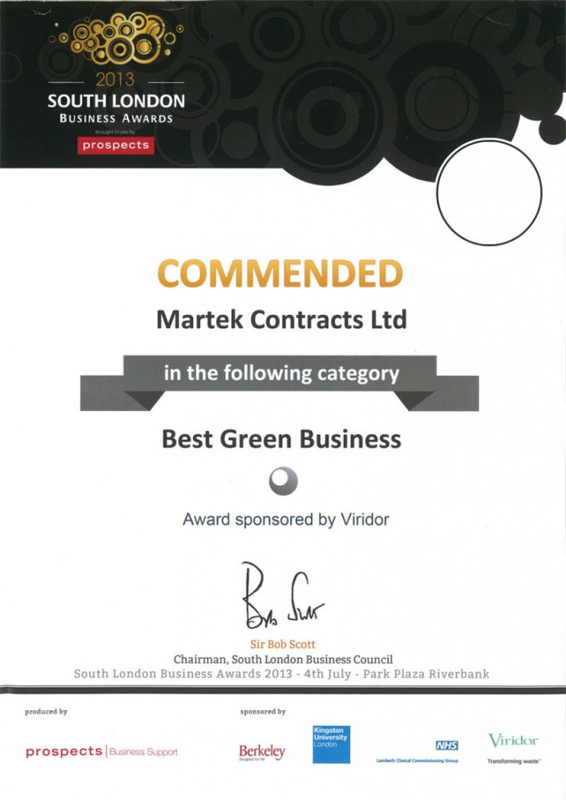 Following Martek’s success in winning best green business, best medium business & best overall business at the Croydon Business Awards earlier this year, Martek were automatically put forward into the South London Business Awards within the best green category. Martek were commended on the evening for their achievements and devotion to minimising waste and improving their carbon footprint. The award was judged and presented by Viridor and the event was hosted at the Riverbank Plaza Hotel on central London’s Albert Embankment.